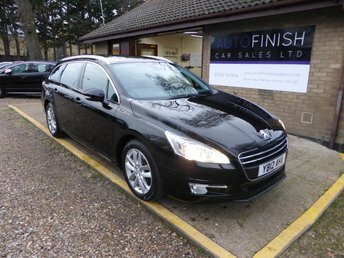 For the best deals on used Peugeot 508 models for sale in Thetford, look no further than AutoFinish. Featuring confident styling and the performance to match, the 508 is a remarkable saloon that offers a highly distinctive driving experience. The best way to find out more about the range of used Peugeot 508 models for sale in Thetford is to pay a visit to AutoFinish. At our showroom you'll find a wide selection of quality used vehicles, all of which have been thoroughly tested by a trained technician before going on sale. Take the opportunity to view our latest stock here on the website before contacting a member of the showroom team for more information. Finance is available to UK residents aged 18 years or older, subject to status. Terms & Conditions apply. Indemnities may be required. Other finance offers may be available but cannot be used in conjunction with this offer. We work with a number of carefully selected credit providers who may be able to offer you finance for your purchase, commission may be received. We are only able to offer finance products from these providers. Postal Address: AutoFinish, Burrell Way, Thetford, Norfolk IP24 3QS. Find contact details here. AutoFinish is authorised and regulated by the Financial Conduct Authority, FRN: 660552. All finance is subject to status and income. Written Quotation on request. We act as a credit broker not a lender. We work with a number of carefully selected credit providers who may be able to offer you finance for your purchase. We are only able to offer finance products from these providers.